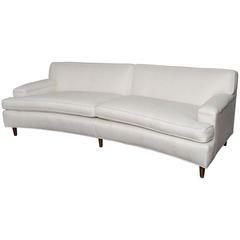 Design Plus Gallery presents fabulous Kensington sofa by Restoration Hardware. Designed by Timothy Oulton, inspired by the Classic Chesterfield. The upholstery still evokes the style the grand gentlemen's club tradition. Deep hand-tufting and rolled arms upholstered in a sand color Belgian linen. Kiln-dried hardwood frame with pocket-coil spring. Three loose seat cushions with a Classic depth. Solid oak feet fitted with antiqued brass casters. Measures: Arm height 30 inches. Seat height 19.5 inches. Original price: $6.395. Tufted leather Chesterfield sofa with nailhead trim, attributed to Restoration Hardware. 1930s wood and fabric sofa reupholstered in grey fabric measure: Height seat 50 cm sold with four yellow pillows.